Sky’s Health and Fitness Centre is the latest cross-laminated timber structure to open on its west London campus, following on from the award winning “Believe in Better” timber building. Antony Oliver tracks the media firm’s sustainable journey. The radical glulam and cross- laminated timber framed structures at Sky sit at the heart of the firm’s global ambitions to develop a low carbon highly sustainable development that delivers new levels of corporate social responsibility. “It really is a testing ground for Sky’s sustainability aspirations and use of spaces,” explains Kristina Arsenievich, sustainability manager at Sky. While the building design is critical, so is the way its space is planned and utilised. As home to Sky’s Academy Careers Lab - a programme to engage 16-19 years olds with work experience, a training suite and an office for over 200 staff, the “Believe in Better” building is designed to be highly flexible and highly interactive to function as a community front door to the firm’s activity. The “Believe in Better” building which opened in 2014 features a glulam structural frame with cross-laminated timber walls and floors which, of course, contribute significantly to the building’s reduced carbon footprint. Through careful architectural design, the resulting space features so much exposed wood crying out to be touched, high floor to ceiling heights and an abundance of natural light and is entirely focused on the needs of its users. The choice of material revolutionised the construction process. It meant that the entire structure could be built by contractor Mace in under a year with off-site fabrication accelerating the project design to site time to just three months after getting the go ahead. Arup has been central to helping Sky through the often challenging process to deliver its bold sustainability strategy, but also highly useable and flexible campus buildings as the Sky headquarters expands. As Adrian Campbell, associate director at Arup, points out, it is all part of a longer journey for Sky to change the way that it approaches the construction and management of its building stock. “Sky has pushed Arup and pushed at the boundaries of what is possible with timber,” he says, highlighting that the learning from Believe in Better has gone into the design of the Health and Fitness centre which opened last month. And learning from that building is built into the design and delivery of the much larger Sky 2 building which will open next year. “Believe in Better sets a precedent in terms of the use of timber as a building material and gave us the confidence to press ahead with the gym,” he adds, emphasising that Sky’s objective of halving its carbon emissions relative to revenue by 2020 has been a critical driver in the use of timber. Campbell also points out that it is not simply about using timber for timber’s sake, but an exercise of using the most appropriate material possible at all times. 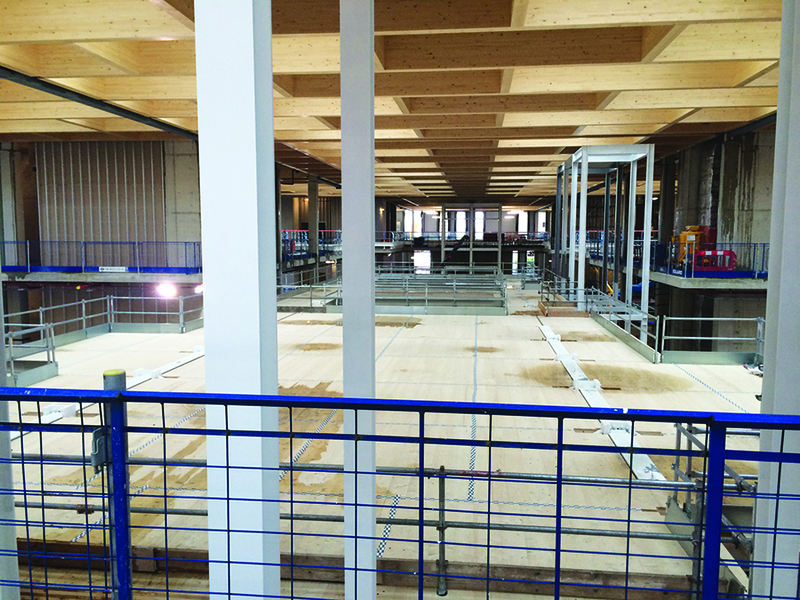 “We have been debating to what degree we can use timber in construction but also what the right application in terms of cost, value and durability is,” he said, reflecting on the fact that the main campus car park could technically have been constructed in timber but remained as steelwork and concrete for other deliverability reasons. “The decision is driven ultimately by cost of delivery and overall performance of the building,” he says. 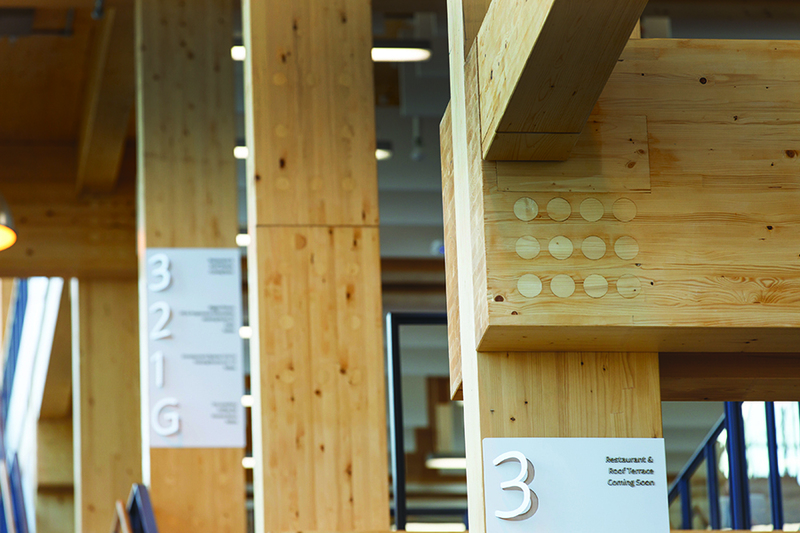 “So while the Health and Fitness centre designed with architect dRMM is certainly a tour de force when it comes to the use of glulam and cross-laminated timber, the material choice was as much to do with deliverability as it was sustainability,” says Campbell. Put bluntly, to design and construct the three storey gym in just 17 months – including the erection of the entire two storey timber frame in just 26 days – just would not have been possible without the off-site fabrication and modular processes that the material enabled. 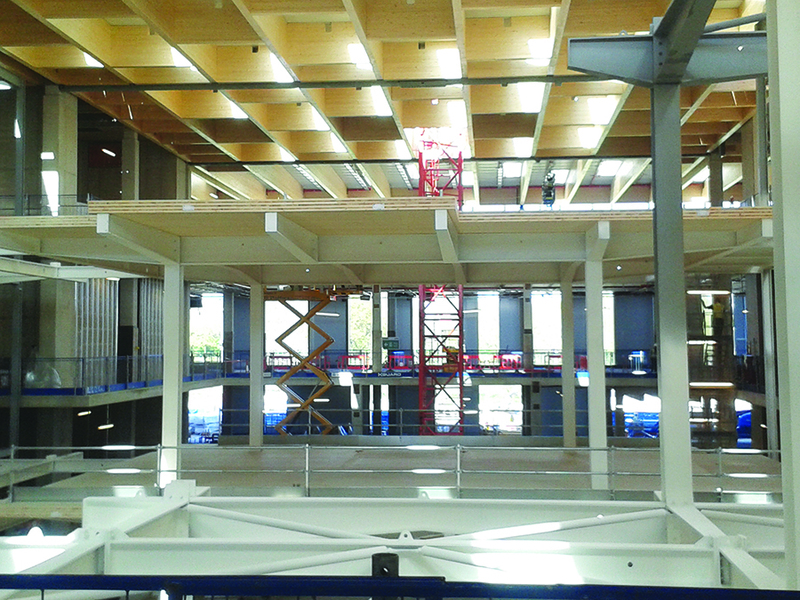 Next in the programme is the Sky 2 building – now known as Sky Central - which in terms of scale, takes the use of timber to a new level in a building measuring some 160m by 90m and with three 5.5m floor to ceiling height storeys. However, for this building the timber journey, while still challenging and significant, has taken a different track with glulam featuring simply in the roof structure. Simple is perhaps an understatement given the spans achieved and that there are almost 10km of glulam beams in the roof structure spanning up to 21m - some of it for architectural reasons. But the choice of a concrete and steel main frame with infill steel and timber mezzanine levels demonstrates the sustainable journey that Sky has been on. On Sky Central again the driver is clearly speed of delivery. The use of steel gave the speed benefits of off-site fabrication but also met the flexibility and future proofing of usage needs required by the client, not to mention the visual demands of AL_A and PLP Architecture which followed. Importantly, feedback from Sky staff has been very positive. “Occupier engagement has been the greatest learning experience - staff love the building,” says Arsenievich. With the building set to open next year to complete a two year construction programme, there is clear evidence that its goals are being achieved. Without question the roof with its timber and skylight infills has driven down carbon but it also looks stunning. Technology is driving the future of infrastructure – are we ready? Can the UK re-learn to plan infrastructure for the long term?